With over 150 medical references Functional Emotional Fitness™ represents a scientific breakthrough in mental health and it has done this without meds, labels or personal history. Kelly has accomplished this by defining ‘Normal’ in an industry, which only defines broken or disordered. Without a definition of “Normal,” virtually anyone on the planet is open to diagnosis of a disorder and subject to endless harmful medications. With a focus on behavioral science for over thirty years, Kelly Burris, PhD is the author of ten books on human behavior with six of them exclusively dedicated to the participants of his Functional Emotional Fitness™ coach training program. Kelly is responsible for overseeing training and certification of all Burris Coaches and Master Coaches worldwide. His most recent book “Depression Anxiety and the Brain in Your Gut”, is the result of over 30 years of research and development of the empirically sound Functional Emotional Fitness™ Process. Functional Emotional Fitness™ is a system to benchmark normal, as the first step to creating measurable change. Defining normal breaks the cycles of therapy and medication dependency and produces measurable progress to desired outcomes at every session. The Burris process has been used with exemplary results for MDD (major depressive disorder), PTSD, addiction, anorexia nervosa and co-occurring disorders. Functional Emotional Fitness™ (The Mechanism of Emotion and The Gut-Brain Influence) by Kelly Burris is a nonfiction health and fitness book that would appeal most to a mixed audience of adults and young adults who are looking to improve themselves through increasing the level of emotional fitness in their lives. This book offers the tools needed to overcome both mental and physical conditions and disorders through enabling a person to control how they feel each day. The tools, methods, and techniques do not require medication, medical history, and labels. These methods are designed to help you improve health without putting more harmful chemicals into the body. Are you ready to better yourself without medicine? 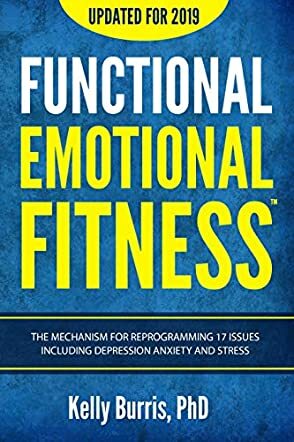 As a psychology student, I was very impressed by Functional Emotional Fitness™ (The Mechanism of Emotion and The Gut-Brain Influence) by Kelly Burris. The fact that the book had such a large grounding in the same psychology I was learning in college, yet lacked the dry textbook style of writing, made it an interesting read. I feel that I learned more about the psychology of health from this book than I did from my health psychology textbook because this material made sense, was backed up by evidence, and was easy to understand. I personally found many of the techniques to be easy enough to apply to my own life, so I plan to do this as soon as I finish my current semester. I liked how Kelly Burris used a writing style that was based on clear facts and evidence, yet also made the material seem like something that could be easily applicable in everyone's life!